So you've discovered our new donation button - great find! We deliberately decided against annoying ads. This means hosting and any costs like special modifications are payed by myself and some early birds who discovered the previously hidden donation feature. Use the forums subscription feature. It uses paypal as gateway but you can use your credit card via paypal as well, so you don't need an account there. Currently we have no other payment-gateway available. On our donations page just select the amount to donate from the offered options. If you select "Make this a recurring payment" the same amount will be automatically donated each month. You can cancel it anytime. We prefer smaller recurring donations rather than larger one-time donations, as it helps us to estimate with what we can work each month. If you have any questions, just ask in this thread. What will the donations be used for? For the future we are thinking of upgrading to a dedicated server which should speed up the site drastically and also improve flexibility as well as search enginge visibility. This would raise our monthly costs from 23$ to an estimated 70$. Do I get anything in return? The warm feeling that you are a major reason why your favourite fractal place on the net stays online and keeps evolving! Also, if you don't want to donate anonymously, we will activate a little badge in your profile, showing you are a supporter. Just reply to our confirmation email. I hope that a lot off members will support the forum. Every (little) donation is very welcome, to keep the site up and runnimg! So, don't hesitate, just donate! Can we have regular updates on how the funding of FF is progressing? I'll update when I'll back from holidays with family. What would I need to donate to cover the next 12 months costs (including any one off costs)? As far as I know, Let's Encrypt (https://letsencrypt.org/) offers free certificates. Is there a reason why this is not used? as our costs are 23$ (hosting, domains, ssl certificate) a year adds up to 276$ currently. Because I hadn't looked into it before and preferred to spend 3€/month for the out of the box solution instead of investing hours of my time into finding a financially free solution. After some quick research, let's encrypt only works with deeper access to our shared server which our hosting plan doesn't offer. we could also produce a self-signed cert, for free, and the encryption is the same, unless something has changed since I last played around with that. the browsing public will be notified the first time it is encountered but after it's accepted it acts just like any other cert. my provider, easyDNS, lists certs from $1200.00CDN to $24.95CDN per year, to me this is all robbery! a site should be able use T/SSL without incurring a cost as it's part and parcel to the internet's functionality and protocols. https://letsencrypt.org/ earns all of their income from donation and sponsorship, issuing certs for free! can anyone demonstrate that a selfsigned cert (or free cert) is less secure than the costly versions? and don't just google it and regurgitate, I am willing to setup a selfsigned (or free cert) https site just for you to demonstrate the hackability of the encryption... any takers? we have one site here with only a few (comparatively) users, I'm very surprised that it's not hosted on a box in someone's livingroom! Disclaimer: I'm a crusty old fart that thinks we are all being robbed blind by politicians, bankers and big business, this is only my opinion . 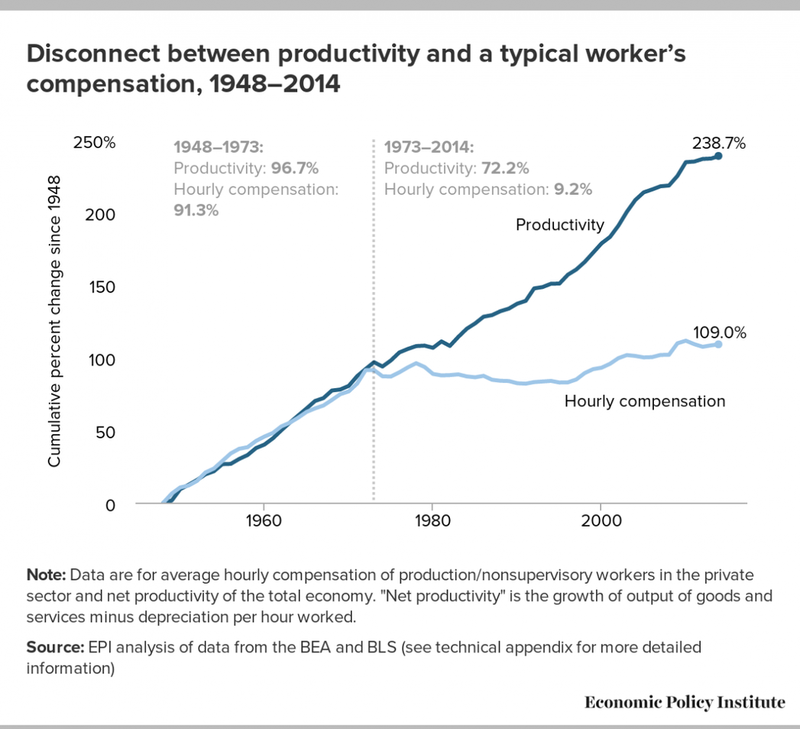 As you can see, in the mid-70s productivity and wages both flattened -- something to do with an energy crisis? -- but since about 1981 and the Reagan presidency productivity was climbing again whereas wages remained more or less stagnant. That means the wealthy rentier class have been absorbing 100% of the gains from increasing per-capita productivity since then: keeping all of the surplus for themselves. OK, looks like someone broke the image tag. I'll just have to upload a copy as an attachment. Original is at https: //thumbor.forbes.com/thumbor/1280x868/https%3A%2F%2Fblogs-images.forbes.com%2Ftimworstall%2Ffiles%2F2016%2F10%2Fwagescompensation-1200x1093.png so you can check it's not doctored. ...so we need about $300 to cover yearly costs. Not much in the grand scheme of things. Thanks P for the nice graph to backup my asumptions. I think a selfsigned cert would be ironicaly apropo, for a fractal site. What I'd be interested in to know is what comes in monthly through the Paypal-subscriptions. That would give an indication of how much would be needed to make ends meet. wow, who would have thought such a diverse group of nerds would all be such revolutionaries? a handful of people own more wealth and resources than half the world's population combined, and this is by design, not by accident. this doesnt come about by a few people working really hard and getting the just rewards of what theyve earned, as you would be led to believe. the central-banking debt-money system that has been put in place the world over is designed to make slaves of us all. contrary to the fear mongering promulgated by the rich and powerful who paint pictures of "socialist" dystopian nightmares to scare you away from ever entertaining the thought of any policies or practices that would ever actually benefit the common man, their central-banking debt-money system is the biggest wealth-redistribution scheme ever devised. except of course it takes all the real wealth produced by the average person and funnels it straight to the top. and in developing nations you have institutions such as the IMF going in, lending them their debt money, and then taking all their resources. from the worst off in the third world to the best off in the first world, all of our qualities of life could and should be SO much higher than they currently are.